In 1975-79, almost two million Cambodians lost their lives to murder and famine when the Khmer Rouge forced the urban population into the countryside to fulfill their ideal of an agrarian utopia. The notorious detention center code-named 'S21' was the schoolhouse-turned prison where 17,000 men, women and children were tortured, interrogated and executed, their "crimes" meticulously documented to justify their execution. In this award-winning documentary and astonishing historical document, Rithy Panh and his team undertook a three year investigation involving not only the survivors, but also their former torturers. They persuaded both groups to return to the actual site of what was formerly S21, now converted into a Genocide Museum, to face their past. One survivor, Vann Nath confronts his captors, some of whom were as young as 12 years old when they committed their atrocities. Human Rights Watch, widely regarded as one of the most influential and important human rights organizations in the world, and First Run Features, which for 25 years has distributed films that confront human rights issues, formed a collaboration to bring awareness to films that shed light on human rights abuses throughout the world. 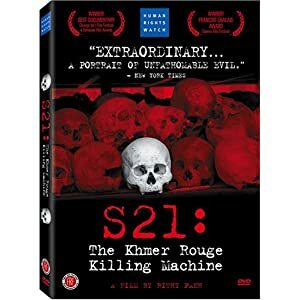 S21: The Khmer Rouge Killing Machine is the first title in the HUMAN RIGHTS WATCH SELECTS DVD series.